Northern Pakistan has a rich biodiversity which is threatened due to poverty and limited options for sustainable livelihoods. IN2NI partner ProFound joined up with the UNDP-GE Mountains and Markets project, which aims to improve the livelihoods of local communities, by providing sustainable solutions to use the rich biodiversity. In early November, ProFound trainers visited Northern Pakistan together with the Dutch government agency CBI (promoting imports from developing countries) and the Mountains and Markets project. 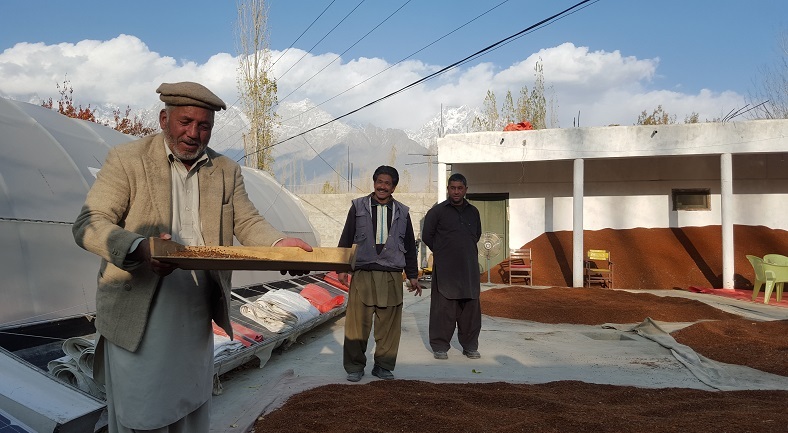 To promote good collection and processing practices as well as sustainable sourcing from these mountain areas, the team visited local cultivation and wild collection areas as well as local processors and companies in the Skardu, Astore and Gilgit areas. The goal of CBI is to design a programme focused on local value addition and innovative sustainable sourcing to provide long-term benefits to the local communities. Many of the visited companies are part of the CBI Export Coaching Programme on natural ingredients in Pakistan. This allows them, after extensive preparation, to participate in several trade fairs on natural ingredients under the umbrella of CBI. Coming February, the first companies from the north of Pakistan will be exhibiting at BIOFACH 2016. Invited by the Mountains and Markets project, ProFound also provided two trainings on the benefits of harmonisation of sustainable standards, such as organic and FairWild. During the trainings, Michael Schwegler, a FairWild auditor and trainer, explained the benefits of the use of sustainable standards as well as the harmonised documentation for a one-stop certification process as developed by ProFound. Participants included local communities, organised in Community Biodiversity Enterprises (CBEs), local support organisations and small and medium-sized enterprises (SMEs). ProFound aims for a pilot on organic/FairWild certification of Chilgoza pine nuts from Pakistan, which will start in early 2016. 0 Responses on Promoting sustainable sourcing in Pakistan"